Whether you love to host dinner parties with your friends or prefer casual meals with your family, this modern chair will be a stylish addition to your dining room ensemble. 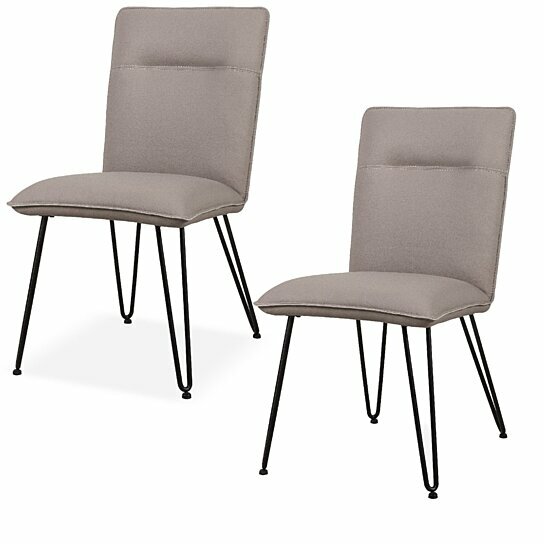 Supported by black finished hairpin style metal legs, this chair features a taupe gray faux leather upholstered cushioned seat and back that provides superior cushioning for leisurely hours of thoughtful conversation. Accented with contrast stitch details on the back, this dining chair has an armless design that encourages movement and discussion around your table. Pull this stylish dining side chair up to your dining room table to enjoy elegant dinners and Sunday family brunches alike, or add it to the foyer topped with a patterned pillow for a pop of eye-catching appeal. Note: Includes only one dining side chair only. The chair features unique hairpin style legs. Supported by metal frame this chair has faux leather upholstered seat and back. The chair is adorned with a contrasting stitch design.